Angels Breath puts his Cheltenham Festival credentials on the line in the MansionBet Sidney Banks Memorial Novices’ Hurdle at Huntingdon on Thursday. The five-year-old is 5-1 ante-post favourite for the meeting’s curtain-raiser, the Sky Bet Supreme Novices’ Hurdle, on the back of an impressive debut under Rules at Ascot in December. 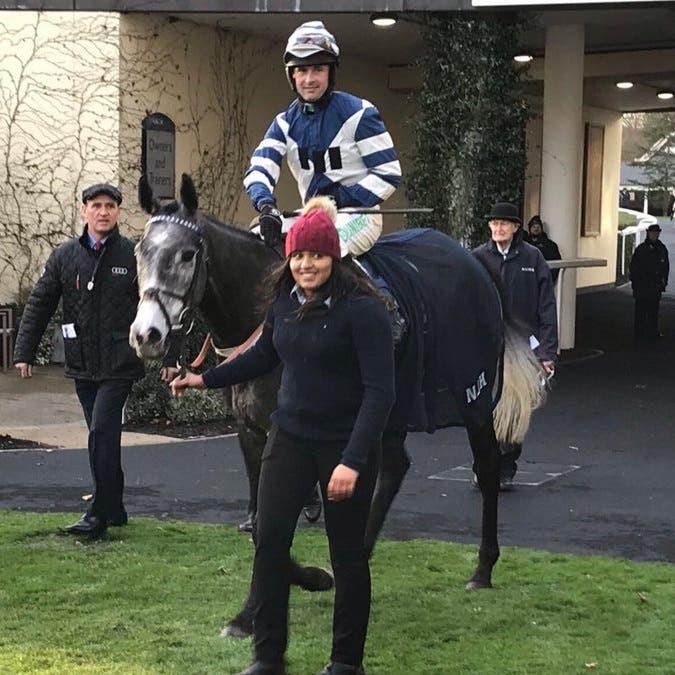 However, with several of the obstacles omitted, connections of the Nicky Henderson-trained grey did not learn as much as they could have done. Angels Breath missed an intended engagement at Haydock last month, but is ready to get some valuable experience under his belt before Cheltenham, where he also holds an entry in the Ballymore Novices’ Hurdle. Running over a longer distance should also help Henderson and owner Dai Walters as they look to next month. The latter has another leading contender for the Supreme in the Nigel Twiston-Davies-trained Al Dancer, who heads the betting for Betfair Handicap Hurdle at Newbury on Saturday. “Let’s hope he runs well. We’ll know what it’s all about after he runs tomorrow,” said Walters. “He only jumped four hurdles in Ascot. That wasn’t a true picture. “If he runs well tomorrow, he won’t run again until Cheltenham. Henderson reports Angels Breath to be fighting fit for his second start over hurdles. “We’ve got through the bad weather so it’s time to get going. He needs the experience,” said the Seven Barrows handler. “He’s been working great and he’s in good form. He’s going up to near two and a half miles. That’s fine, I’m not worried about it. The plan is to come back to two, I would think. We’ll see what happens tomorrow. Warren Greatrex has a good record in this race in winning it in 2016 and 2017 and saddling the runner-up 12 months ago. Emitom has earned the right to be his representative this year after being unbeaten in two races over hurdles and in bumpers. The Lambourn handler accepts Angels Breath will be a tough nut to crack. “Everything has been OK and all has gone to plan since Lingfield. The snow the other week was a bit of a pain, but he didn’t miss anything,” said Greatrex. “Nicky Henderson is taking Angels Breath there and it looks a hot renewal. It will be a good test for him to see what he can do. “He has schooled well since Lingfield. I’m half thinking that in a better race he will be more switched on and that his jumping will therefore be better. We can’t do any more than what we have done at home. He can lose his concentration a bit, but again in a better race he should be more alert. Olly Murphy sends I K Brunel, who made a promising jumps debut when third to subsequent Tolworth Hurdle scorer Elixir De Nutz, while Dan Skelton saddles Anytime Will Do, who returns to action after winning his first two starts over hurdles at Uttoxeter and Bangor in October. Mick Channon’s Hold The Note, who opened his account over jumps at Doncaster in December, and the Fergal O’Brien-trained Strong Glance complete a fascinating six-horse line-up.